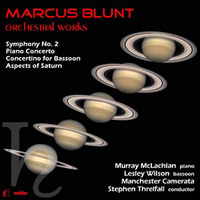 MARCUS BLUNT (b.1947): Symphony No. 2, Piano Concerto, Concertino for Bassoon and String Orchestra, Aspects of Saturn for String Orchestra. Description: As we encountered in the pioneering disc of his piano music from a few years ago (06P083), Blunt is a refined and approachable composer working in a tonal idiom not a little influenced by the harmonic ambiguities of Scriabin, for whom he has a long-standing affinity. The substantial, three-movement concerto is reminiscent of Prokofiev, Rachmaninov and quite a lot of late Scriabin. The first movement, which explores the ramifications of a thematic fragment presented at the outset, has a strong sense of narrative drama. The slow movement is spare, tense and mysterious, relaxing into a greater sense of calm after its central climax; the finale's sprightly energy displaces this, exploring variants of themes from the previous movements before an extended cadenza leads to the work's triumphant peroration and oddly abrupt and ambiguous conclusion. The four-movement symphony may be relatively brief, but it belongs firmly in the British symphonic tradition. The first movement is restless and discursive; the slow movement nocturnal but rising to several imposing climaxes; then follows a scherzo which metamorphoses into a more serious mood of impressive breadth, and an angular, vigorous finale which weaves together motifs from earlier movements. The Concertino is a diverting work in five short movements, not without its serious moments in the songlike second movement and the elegiac fourth, while Aspects is a short, serious tone poem which explores various associations of the mythological and astrological figure of Saturn. Murrray McLachlan (piano), Lesley Wilson (bassoon), Manchester Camerata; Stephen Threlfall.